Each part of this strategy is being implemented, and al Qaeda’s plan has advanced to the final stages. 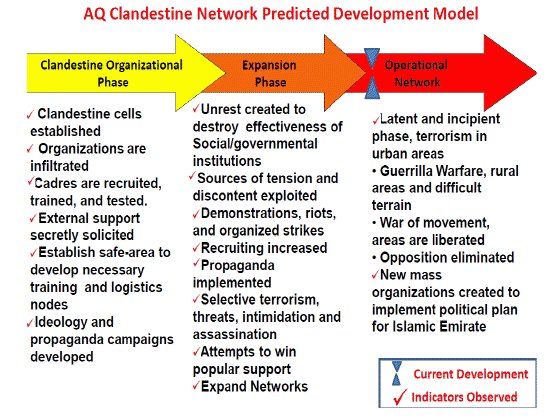 The three conceptual phases of an al Qaeda affiliate’s development are outlined in a chart prepared by the US military and shown here. The chart shows that, according to the US military, al Qaeda’s operatives in Libya have already completed many of the tasks set forth by AQSL. “AQSL in Pakistan dispatched trusted senior operatives as emissaries and leaders who could supervise building a network,” the report notes. They have been successful in establishing “a core network in Libya,” but they still act clandestinely and refrain from using the al Qaeda name. 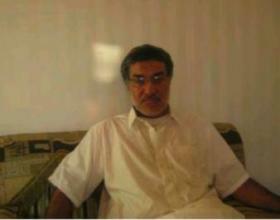 Al Qaeda’s emir, Ayman al Zawahiri, has overseen the effort to establish a robust presence in Libya. Other senior al Qaeda operatives in Pakistan have also been involved. Abu Yahya al Liba and Atiyah Abd al Rahman, two top al Qaeda operatives who have been killed in drone strikes, helped guide the project prior to their demise. Some al Qaeda operatives have been tasked with taking over, or forming, katibas — or fighting battalions. 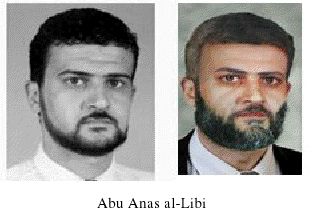 Others oversee al Qaeda’s project and coordinate with senior leaders operating elsewhere. The report says that “intense communications” from AQSL in Pakistan are passed through Abu Anas in Libya. Sufyan ben Qumu is a former Guantanamo detainee who has been tasked with training militia fighters. According to other published accounts, Qumu leads a brigade named Ansar al Sharia, but that is also the name of al Qaeda’s umbrella organization in Libya. Qumu was transferred from Guantanamo to Libya in 2007 and set free in 2010 as part of a general amnesty deal the Qaddafi government granted Islamists and jihadists. 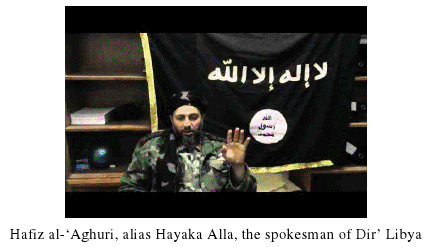 Qumu has denied any links to al Qaeda in interviews with the press. 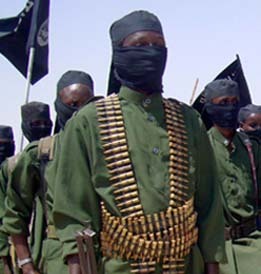 However, the authors of “Al Qaeda in Libya” say the Ansar al Sharia battalion led by Qumu “has increasingly embodied al Qaeda’s presence in Libya, as indicated by its active social-media propaganda, extremist discourse, and hatred of the West, especially the United States.” Qumu has led a campaign of targeted assassinations, including against those opposed to al Qaeda. 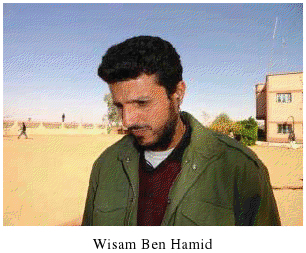 Qumu is reportedly suspected of involvement in the attack on the US consulate in Benghazi on Sept. 11, 2012. In addition, the name Ansar al Sharia is used by multiple groups inside Libya. 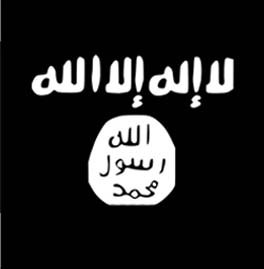 It is not just the name of individual battalions, but also may be al Qaeda’s new overall brand in Libya. Ansar al Sharia is being used by al Qaeda in Yemen, Tunisia and elsewhere to rebrand itself as an organization that represents true Islamic law. 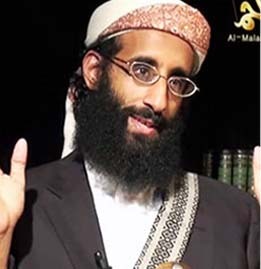 For example, the emir of al Qaeda in the Arabian Peninsula, Nasir al Wuhayshi, is also the emir of Ansar al Sharia Yemen. The various Ansar al Sharia branches have their own social media sites, including in some cases Facebook pages. Their digital presences, while containing some differences, are also eerily similar. Much of the content and branding is the same, and they all praise senior al Qaeda leaders. 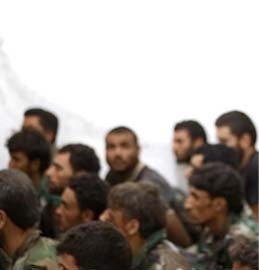 In all, 15 militias attended the Ansar al Sharia rally. It is not clear how many are firmly within al Qaeda’s orbit, allied with the group, or otherwise positioned. Even if some of these militias are not staunchly allied with al Qaeda currently, they may cooperate or be co-opted by the group in the future. “Al Qaeda in Libya” contains graphic evidence that al Qaeda-affiliated battalions have already acquired heavy armaments, including mobile rocket launchers and self-propelled antiaircraft guns. As al Qaeda’s clandestine network continues to acquire arms, the group will have more firepower with which it can target any dissenters, as well as the shaky Libyan government. Al Qaeda is doing its best to destabilize the new post-Qaddafi government, seeing an opening to inculcate its radical ideology and organization during a time of uncertain transition. Al Qaeda is also exploiting tribal and ethnic conflicts, using them to “build alliances and support, especially in the south, where Arab tribes are fighting the Tubu (Tebu) African minority that straddles the Libya-Chad border.” One of the al Qaeda-connected battalions, Dir’ Libya, is fighting alongside the Arab tribes against the Tubu. Al Qaeda’s growing presence in Libya is not self-contained, but instead part of an international network. Al Qaeda operatives in Libya work with their counterparts in al Qaeda in the Islamic Maghreb (AQIM), a known al Qaeda affiliate, and other parties throughout North Africa and the Middle East. A clandestine network in Libya is just part of AQSL’s plan. The way you posted this entry, it makes it seem like Al Qaeda is so much interwoven into the country, that the words “Al Qaeda” and “Libya” might as well become synonymous with each other. I wonder what the pro-war progressives have to say about the recent events in Libya? We have heard NOTHING coming from them. Although I would imagine showing them something like this would give make them be more in denial about the situation. In fact, they are so silent you could hear a coin drop from across the street. Was the removal of Qathafi really worth this much agro ? I say no. A classic case of the tactical over the strategic . sundoesntrise: What is your point? You don’t do your research and yet you throw out accusations. This is a serious situation evolving in North Africa and there is a strong American military presence close by. this information is a waste of the Governments time & taxpayers money. This so called Congressional Report could have easily been culled from the TLWJ & its many contributors months if not years ago. Reports this morning (22-09-12) on the B.B.C. that ‘mobs’ in Benghazi have “stormed” militia bases in that city. The reports claims this action has been sparked by anger over the recent assassination of U.S. ambassador Christopher Stevens. Report is filed on B.B.C. 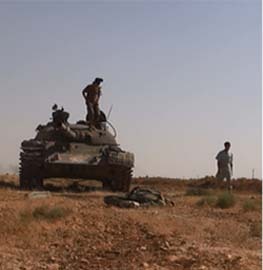 website under the headline “Libya: Islamist militia bases stormed in Benghazi”. For some reason, libyan foreign fighters were very active in Iraq, outnumbered only by the saudi foreign fighters. It is interesting that 3 million Libya provided more foreign fighters than 80 million Egypt. Well maybe before you throw out your accusations, you would do well to know I have done all my research since the start of this ill-advised military adventure. I don’t know what point you’re trying to make, my original post was not a critique of the author in any way. Al Qaeda has had a significant presence in Libya since February 2011 and it has only grown since then. Now Dan, maybe you’re upset about what I said about the progressives. In that case, don’t you think the pro-war advocates should’ve at least done more research about the situation on the ground and the true identity of the fighters we helped out before they sent personnel and military hardware on such a big mission? Yeah, I remember reading those type of statistics a while back. Libya is just across from Europe, next to Algeria, around the Sahel, it is a global outpost for Jihadists to go in either direction, towards Europe, or to Africa to go wage Jihad there. I always wondered why with all the information available to us, why we were so hasty to get involved in such a volatile and hostile pocket of the world, presumably to “save civilians”. Because when I noticed that other Arab dictators were allowed to freely slaughter their own people without fear of intervention, I became suspicious of the “humanitarian intervention” the pro-war progressives tried to label the war as. @ Sund Said: In fact, they are so silent you could hear a coin drop from across the street. You hear that coin? Yes, you said that. What ill-advised military adventure are you referring to? If McCain (a GOP hawk) had anything to do with it, we would have boots on the ground in Libya and Syria. You really want to send troops there? How many US lives do you want to waste there? How many years do you want to spend there? How much money do you want to spend rebuilding their infrastructure which is required when you intervene with a military presence? We have nothing to spend! We need to choose our fights carefully. We need to bomb Al Qaeda till the cows come home and this we agree on, I think. How we do it is the question. To get involved in every ME problem is just not a realistic position that the US can be in. I can see very quickly that you are a partisan commentator, so naturally it’s more frustrating talking to you, but McCain has said with Syria and Libya many times over that troops on the ground would not be necessary, but that they should be on stand-by incase we need them for a special situation. Libya was not a partisan thing, war-mongers from both parties came together for the effort. And yeah, you quoted me about what I said that AQ has had a presence in Libya since February 2011. Can you actually prove me wrong about that? I don’t even feel like posting up proof of such things (because you have no excuse for not looking up such material yourself), but I can post such material if you like. I never claimed any such things, Dan. The solution?Don’t intervene from the start! Problem solved. Once again you are playing the role of the partisan hack. There is no room for disagreement on taking out Al Qaeda, but let me tell you this Dan: Handing them Libya, across from Europe, near the Sahel, a transit point for immigrants and militants from across the world, is no way to start when it comes to fighting AQ. We didn’t “beat them” in Libya, Dan, we handed them a huge victory, and we knew they were there and we didn’t even touch them. Not only have ‘we’ “handed” Libya to AQ and their like minded associates/collaborators ‘we’ve’ also via our ally/non-ally(? 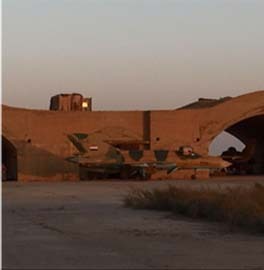 ), Egypt, allowed the Sinai to slip into limbo. Interestingly enough much in the same way El Salvador and Honduras allowed Chalatenango & to a lesser extent Lempira & Ocotepeque to become a rallying point(s)/platform(s) for the insurgency’s that came to envelope their nations & Central America At Large. The US has also allowed for conditions, due to their gross mismanagement of disengaging from Iraq, for the North East sector (Turkey, Syria, Lebanon, Iraq) of the ME & that which is South of the Caucasus Mts to fall prey to elements whose interests run counter to whats best for the region & its people. About time. But they are still dancing around the obvious close ties between the LeT and the ISI, and therefore by extension between the ISI and bin Laden. And the ISI is part and parcel of the Lybia military. Therefore, until the Generals and their families abroad start to feel economic and travel pain from their terrorist activities, they will feel no pressure to stop their support for groups. @mike merlo: Exactly right. The only questions that remain are what form the blowback will take, when it will happen and where.